It is a beautiful day in sunny Bradenton, Florida as NMRA Spring Break Shootout qualifying officially is underway. Horsepower & Heels is here covering the event to check-in with the drag racing ladies of the National Mustang Racers Association. The 2015 reigning Coyote Modified champ, Haley James suits up for her first qualifying pass of the 2016 season. They made very few changes to their program over the offseason, and arrived in Bradenton ready to defend the championship title. Haley qualified #4 with an 8.438 @ 155.60 mph in the opening round. 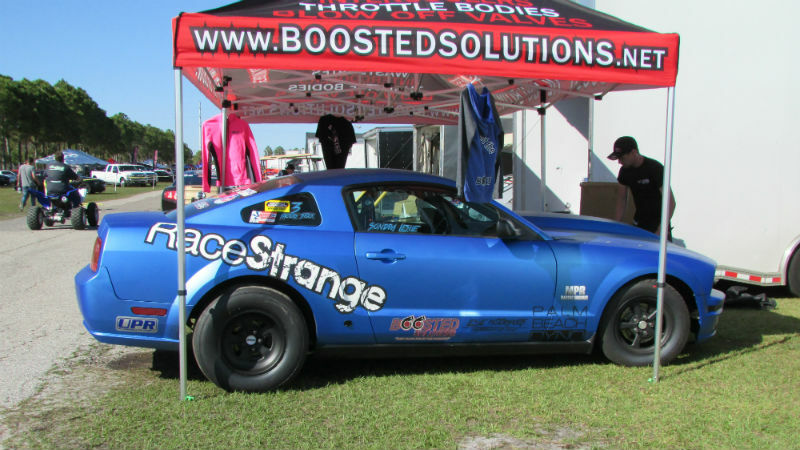 Factory Stock racer Sondra Leslie debuted a new look on her 2006 Mustang, wrapping her Race Strange sponsored ride in a new pearl blue. Hoping to get a jump start on improving her 3rd place 2015 overall Factory Stock finish, Sondra opened qualifying with a 11.718 @ 112.82, as she works out some traction issues. Husband and wife duo, John and Melissa Urist are commonly found together in the staging lanes, but this time it’s Melissa behind the wheel of her 2015 Hellion Turbo Coyote Shootout entry, with John standing by as crew. Melissa ended last season with solid 8 second ETs, and the team found even more power in the offseason. A boost mix up on line and Melissa’s first qualifying run resulted in an off-pace 10.398 @ 130.02 mph. Missy Laughridge was ready to go in her beautiful white Cobra Jet. She is taking on the field in the NMRA’s competitive Cobra Jet Shootout class. Other sightings include: Susan McClenaghan and Roxanne Shepard in Modular Muscle; Stephanie Davis, Cindee Hall, Carole Lissy in Ford Muscle; Kennady Jones and Nina Gusler in Truck & Lightning; and Super Stang’s Becki Belcher. Stay tuned tomorrow as we bring you more from the ladies of the NMRA.